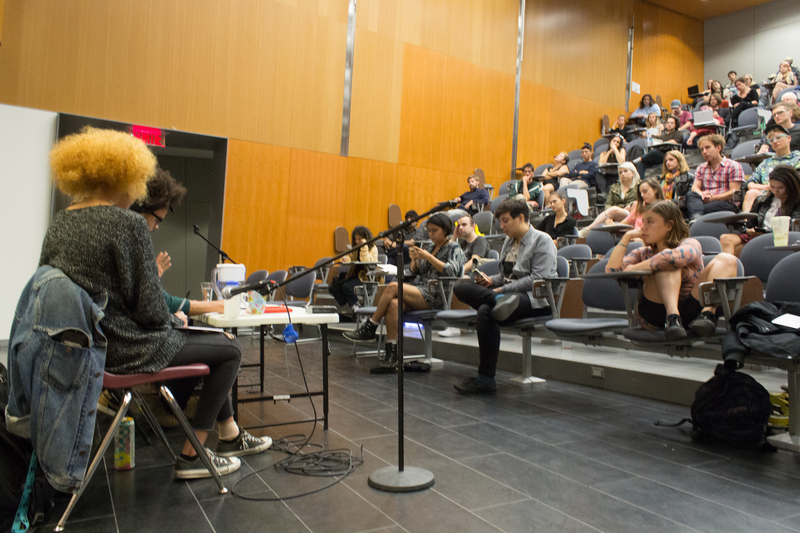 On Sept. 23, Concordia’s Quebec Public Interest Research Group (QPIRG) and the Centre for Gender Advocacy held a discussion panel at the university, where members involved in helping Canada’s black community and a committee member from the Toronto Black Lives Matter movement came to discuss anti-black racism. The event, called “Organizing Around Anti-Black Racism” is part of Disorientation, running from Sept. 19 to 23, as well as the Another Word for Gender event series, running from Sept. 13 to Oct. 4. The three panelists were Robyn Maynard, a mother, writer and community outreach worker based in Montreal; Leroi Newbold, a committee member of Black Lives Matter Toronto as well as a parent and teacher; and RJ Pate, a photojournalist and community organizer. Maynard said she first began her black activism journey when she moved to Montreal. She got involved with the local non-profit organization Head & Hands—which provides a variety of mental and physical health services to Montreal youth. Maynard said that during this experience she heard stories of racism from the individuals she was working with. These were “people who were unable to hang out —like three of them waiting for the metro— without the cops breaking them up, thinking they were a gang,” said Maynard. The panelists did not shy away from discussing current issues that the black community is facing with regards to police brutality. They spoke about the repercussions of brutality, leading to tragedies such as the death in Charlotte, N.C. of Keith Lamont Scott in late September and Abdirahman Abdi in Ottawa back in July. Newbold described the police brutality problems as genocidal state violence. Newbold also said he believed the process of carding—described by the Law Union of Ontario as a Toronto police intelligence-gathering practice—has directly contributed to the deaths of Canadians. The panel also touched upon the apparent buzz word “self-care” used in the activism community, specifically regarding black activism. Self-care is a means of supporting and putting one’s self first by doing things such as eating healthy, exercise and beauty treatments. Newbold said self-care is unaffordable for many, and both Newbold and Maynard said they believe that communities should focus instead on group care. The panelists described group care as checking in with one another and keeping others informed about current issues. Based on their experience, Pate described group care as providing a place to stay and teaching valuable skills to those in need. The panelists all weighed in on how community members can support or ally themselves with the Black Lives Matter movement. Newbold suggested reading and supporting alternative media, challenging family members on instances of anti-black racism and encouraging the sharing of resources and skills. Financial support can be very helpful in sustaining black organizing, Maynard added. Maynard is currently in the process of writing a book, Policing Black Bodies: State Violence and Black Life, which will feature some of the content the panelists discussed and is expected to be released in 2017.